In a wild two weeks in the NFL, Patrick Mahomes, Ryan Fitzpatrick, and James Conner have been three of fantasy footballs biggest studs. This has allowed those with contrarian approaches to big time payouts on DraftKings. With the slates getting tighter and tighter by the week, here is everything to know about the DraftKings main slate. In a week where ownership should be concentrated at the top on Patrick Mahomes, Drew Brees, and Jimmy Garoppolo, Deshaun Watson offers salary relief and ownership leverage in GPPs. While the Giants have only allowed 336 passing yards on the season, they have benefitted from facing weak quarterback competition in Blake Bortles and Dak Prescott. However, they allowed the second-most rushing yard in this span. They're also missing corner Eli Apple. Look for Watson to rip up a weak Giant's secondary and take advantage of available rushing yards. Arguably the number one play on the board, Alvin Kamara faces an Atlanta defense that ranked first or second in receptions allowed to running backs the past three years. Kamara has 18 targets so far this season and benefits from the absence of Keanu Neal and Deion Jones on defense. Last week, the Falcons allowed 14 catches for 102 yards to Christian McCaffrey. Kamara provides a strong foundation for cash lineups. Taking advantage of Joe Mixon injury, Giovani Bernard should slide in as the Bengals feature back. In three games where Mixon didn't play or played limited snaps, Bernard averaged 19.8 touches for 109.3 yards. Carolina's defense has showed cracks thus far, allowing the fourth-most rushing yards to start the season. At 5.9k, Gio can be played in cash and GPPs. Priced as the wide receiver five, Julio Jones enters a blow-up spot against New Orleans this week. Julio currently ranks fourth in the NFL with 28 targets and first in air yards with 477. New Orleans has allowed the most yards to receivers to start the season and Julio flamed the Saints for 98 and 149 yards on two separate occasions last season. Julio provides a solid floor in cash at 7.9k. Always an option in GPPs, Will Fuller remains underpriced on DraftKings. 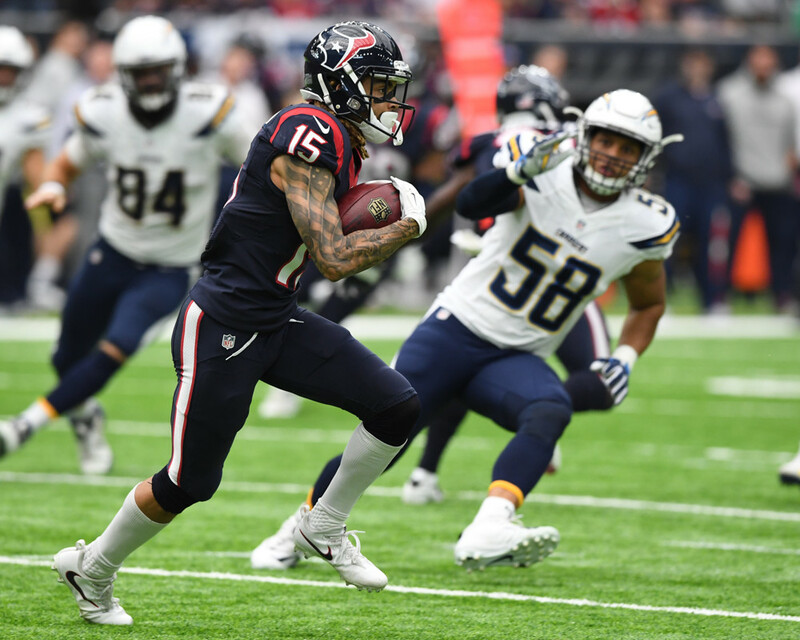 Remarkably, Fuller has 21 receptions for 392 yards and 8 scores in games with Deshaun Watson. Unlike last season, Fuller saw a healthy 9 targets in Week 2. With DeAndre Hopkins showing down against Janoris Jenkins, Fuller should benefit from a projected matchup against BW Webb with Eli Apple injured. Tight pricing renders most players below the 4k mark unusable. One exception to this is Tyler Boyd. Through two games Boyd has out-targeted John Ross 14-6 and out-snapped him 106-81. So far Boyd played 83.3-percent of his snaps from the slot. The Panthers allowed Cole Beasley to record 7 catches for 73 yards from the slot. While not the safest selection, Boyd offers a solid floor and salary relief at 3.7k. WithJack Doyleout with a hip injury,Eric Ebronimmediately enters the tight end conversation. Indy tight ends have been targeted 24 times through the first two weeks and Ebron should immediately see all of that volume. While Philadelphia has played average tight end defense this year, Ebron's volume keeps him in consideration for cash games.